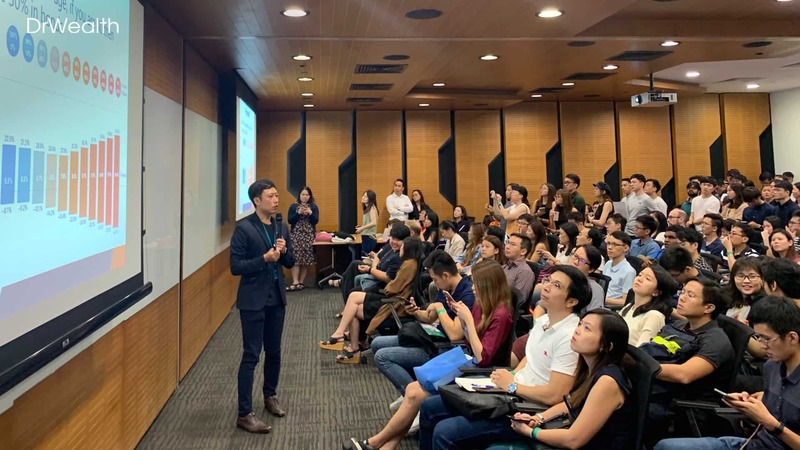 Last Saturday, I was invited by SGX Regular Shares Savings event to present to over hundreds of young investors who were very eager to kickstart their investing journey. The topic I was sharing was portfolio building through the use of stock ETF and bond ETFs. This is a very simple idea for investors who like to DIY their investment to achieve decent returns without spending too much effort. So here’s the write-up & slides in case you missed my talk last week! If you just started to have a regular income but yet to have a pool of money to invest, you can look at RSS to sock away a part of your salary to investments. And you can achieve 5% – 10% returns by building a stock-bond portfolio. 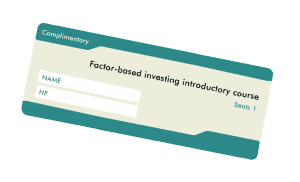 Principle #1: Build a stock-bond portfolio to achieve safe and reasonable returns of 5% – 10% depending on your allocation and market conditions. Stocks generally produce higher returns but riskier compared to bonds which have lower returns but safer. Principle #2: Choose the losses you are willing to swallow and the gains would take care of itself. Refer to the chart below! Principle #3: Rebalance at least once a year (preferably your birthday). This helps you realize your gains and maintain your target stock-bond allocation. When looking at ETFs, look at those with low expense ratio, large fund size and Cash ETFs (instead of synthetic). It’s a combination of stocks and/or bonds you accumulate. 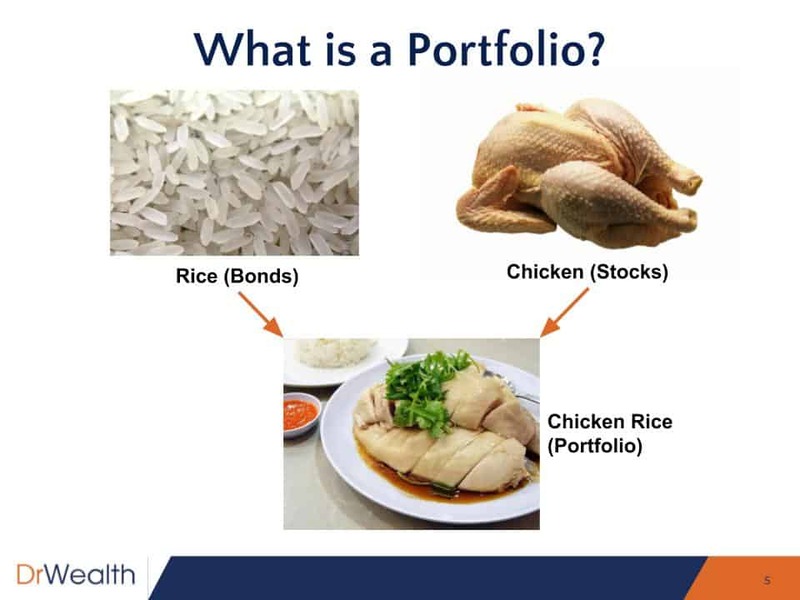 Just like how it takes both ingredients – chicken and rice to make a delicious plate of chicken rice… you need both stocks and bonds to build a profitable portfolio. The higher this number, the higher your risk tolerance. And the lower this number, the lower your risk tolerance. The question is crucial because most investors typically burn their fingers because they overestimate their upsides (potential gains) and underestimate their downsides (risks). If you want to be profitable, you’ve got to manage your risk very carefully – invest safely and then gains will follow. Once you get clarity on your risk tolerance, you can start determining the % allocation of your stocks-bonds. If you can’t tolerate a lot of risks, I’d advise that you allocate more of your portfolio to bonds. 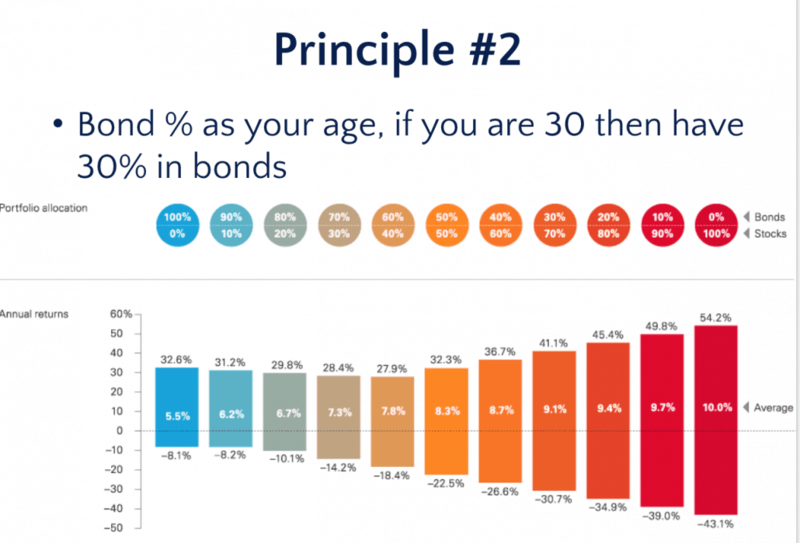 Principle #2: Establish your bond-stock allocation. Choose the losses you are willing to swallow from the chart. Most traditional investing experts would recommend that you allocate more of your portfolio to bonds as you grow older. That means if you’re 30 this year and you’ve 30% of your portfolio in bonds, you might want to look at raising that percentage to 35% 5 years later once you hit 35. Of course, this is a recommendation – not a hard-and-fast rule. But always be clear of how much can you afford to lose. If you can only stomach a 30% loss, you should put 70% in stocks and 30% in bonds. If you can stomach only 10% loss, you should have 20% in stocks and 80% in bonds. What’s get measured, gets improved. You should review your portfolio performance at least once a year. The important action to take is to rebalance your portfolio. 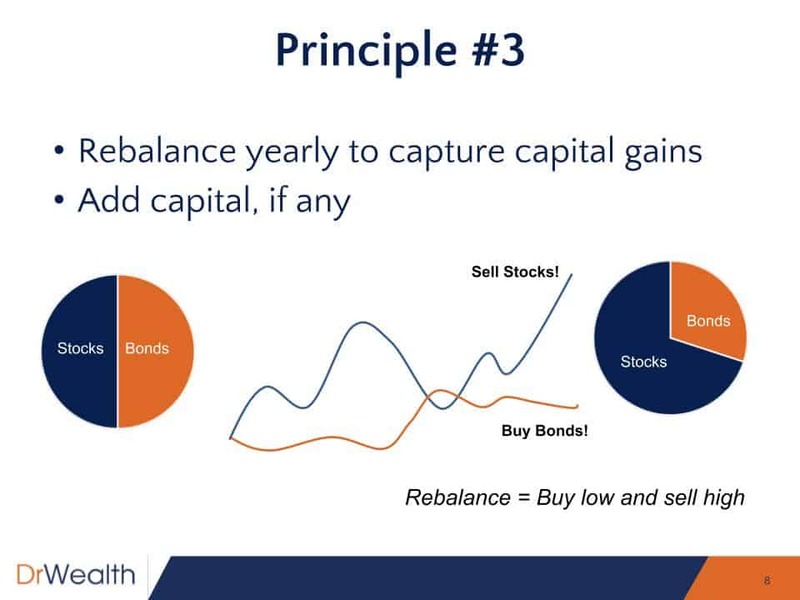 Rebalancing helps you to realise your capital gains every single year. You can’t expect to build a portfolio once and let it run – it’s not a Robo-Advisor or some algorithmic investing machine. Don’t worry. Rebalancing is not cheem at all. Let’s say you built a portfolio with 50-50 allocation to both stocks and bonds. At the end of the year if you’ve 60-40 allocation to stocks and bonds (e.g. your stocks outperformed your bonds and made 10% gains). Bearing in mind that stock market usually performs inversely to bond markets, you rebalance your portfolio by selling the 10% increase in stocks at a high and buying an additional 10% in bonds on a low. Can you see how exactly it’s helping you buy low, sell high? Of course, I used a 50-50 stock-bond portfolio allocation – you can apply this rebalancing strategy to your own personal portfolio ratio. It’s necessary for you to review your portfolio annually so you know how much gains exactly you’ve made. Alright. These are the 3 principles to managing a profitable portfolio. Now, I’m sure as a new investor, you might not be comfortable with picking specific stocks or bonds. That’s why I’d usually advise new investors to go with ETFs. However, not all ETFs are safe – buy the wrong index and you can see your money burst into flames. ETFs with lower expense ratio, the lower the better. ETFs with Bigger fund size. Bigger ETFs have lower expense ratio since they have better economies of scales which allows them to lower their index fees. Also, the bigger the fund size, the better the longevity of the fund. Always pick Cash ETFs over synthetic ETFs. Cash ETFs are ETFs which are invested directly into the assets that make up the index (stock/bonds). Synthetic ETFs involve the use of derivatives like contracts or options to replicate the index they’re following. As a beginner, you should avoid Synthetic ETFs. Index reputation – Avoid the niche indices and go with the mainstream indices like FTSE (Financial Times Stock Exchange), MSCI (Morgan Stanley Capital International) and SPDR. 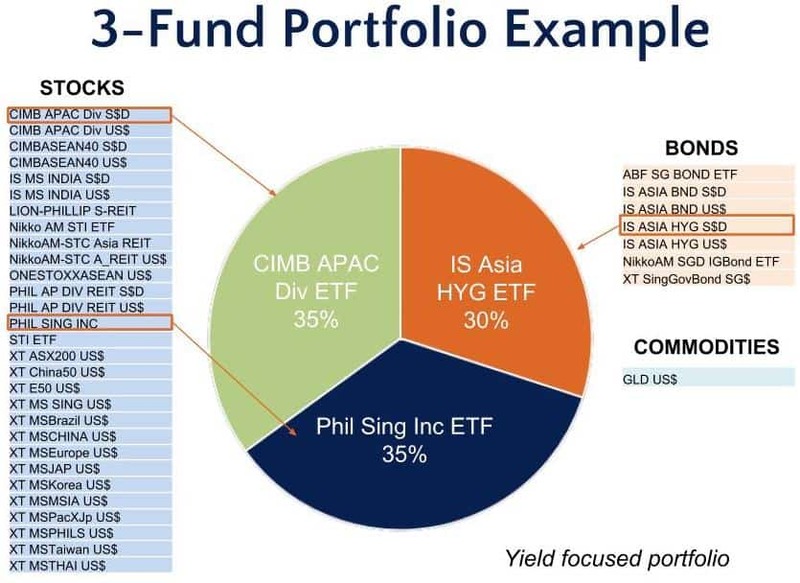 This is a classic Singapore portfolio involving the STI ETF and ABF Bond ETF. 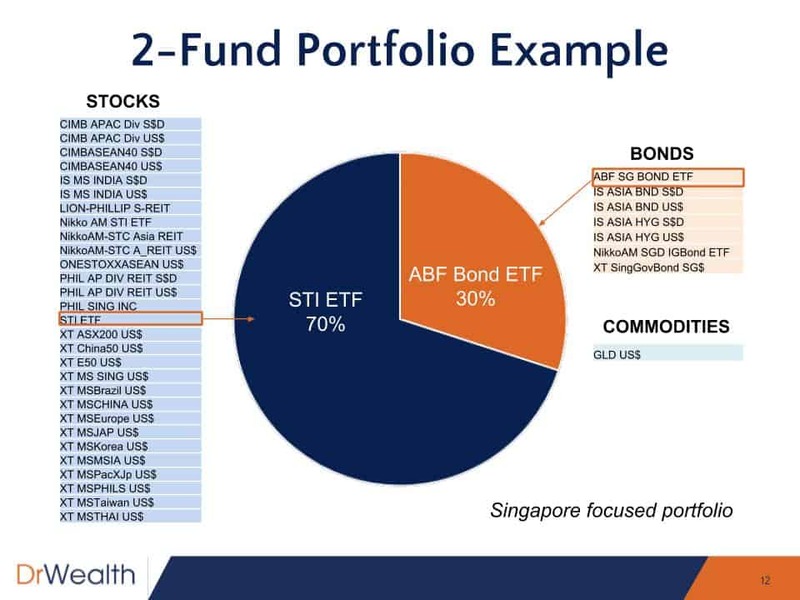 STI consists of the top 30 Singapore listed blue chips while the ABF Bond ETF invests mainly in Singapore Government bonds. This portfolio takes a wider geography exposure to Asian stocks and bonds. This is beyond just investing in Singapore. You can also add more ETFs if you like. Considering 70% is allocated to stocks in this example, one can split the stocks exposure to two ETFs. A REIT ETF might be interesting to some people especially if they like properties and dividends. This last example tilts the portfolio to higher dividends and interests. 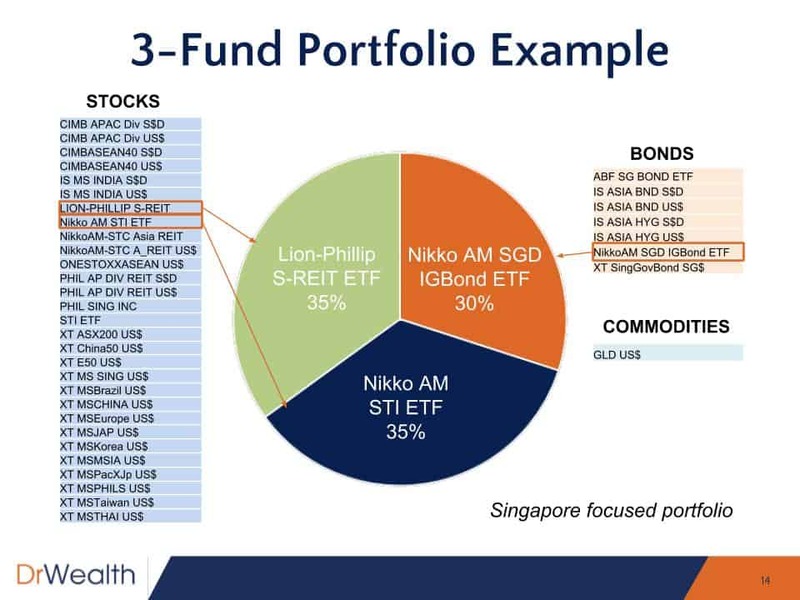 There are ETFs like Phil Sing Inc ETF that invests in dividend-paying stocks in Singapore without being too concentrated in REITs. This would bode well with investors who prefer more diversification. 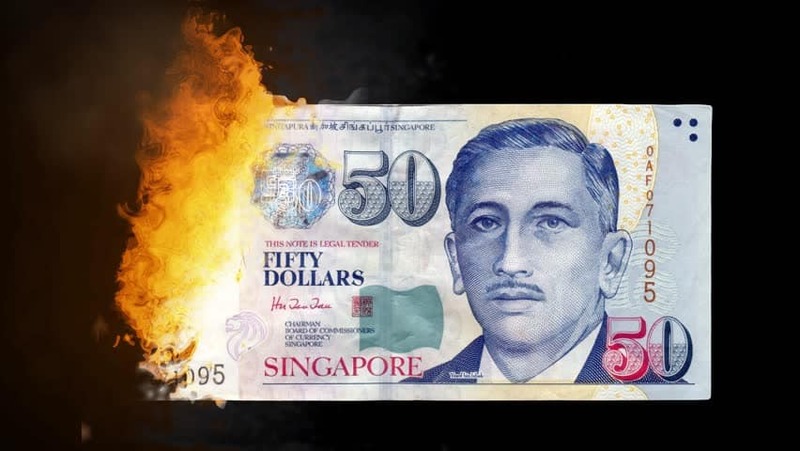 The bond component could also be enhanced for higher interest by going with the iShares Asia High Yield Bond ETF but it would come with higher credit risk. That’s all! I hope the above provides you some vulnerable insights to start your investing journey. 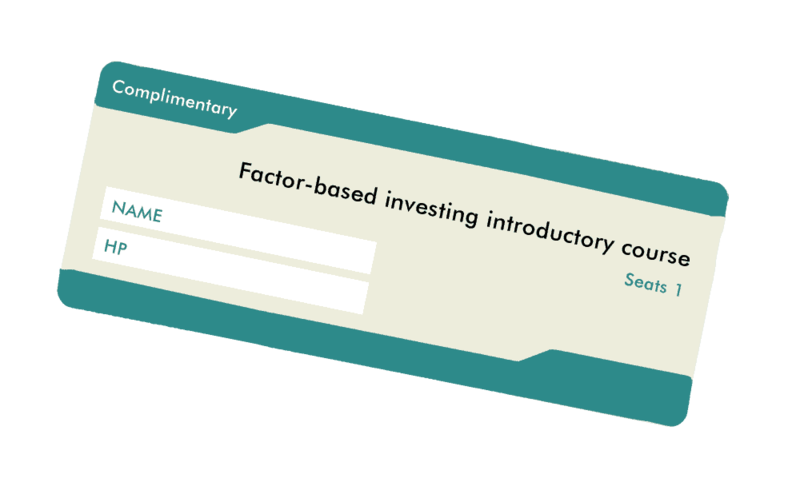 If you like the strategy I shared with you above and want to achieve even better returns safely with minimal effort, I’d like to invite you to my upcoming Factor Based Investing workshop. It is free and I’ll be sharing many real-life case studies of a very systematic investing approach that you can use for finding profitable stocks. Learn step-by-step Factors Based Investing Strategy that produces 100% or more returns! 1. Do you consider CPF SA/RA as bond? 2. Insurance ILP / endowment? 3. What about property investment? 1. I do to a certain extent. The only problem is that it is not so easy to use it to rebalance a portfolio due to the restrictions on investment amounts and options. 2. No. I buy insurance for protection and not for investments. 3. Can be part of the portfolio if the net worth is large, else the property investment is going to dwarf everything else and it become meaningless. Also properties tend to be illiquid and hard to rebalance – you cannot sell a room and keep the rest of the property.